The Global Change Experimental Facility (GCEF), situated close to Halle (Saale) in eastern Germany, is a large-scale climate change experiment that was set up in 2014 by the Helmholtz-Centre for Environmental Research (UFZ) to assess long-term effects of climate change on common European land-use types. Aims Anticipating the effects of future climate change conditions on Middle European grasslands is one important step within the endeavour of providing advice to political decision makers. We aim at forecasting likely shifts, which our grasslands will undergo until end of this century, and would like to contribute well-grounded information on their consequences for pasture and meadow management. Experiment The Global Change Experimental Facility (GCEF), is a large-scale climate change experiment that was set up in 2014 by the Helmholtz-Centre for Environmental Research (UFZ) to assess long-term effects of climate change on five common European land-use types, including extensively managed meadows and pastures. This long-term experiment is projected for a runtime of at least 15 years. It exposes plant communities not only to increased temperatures and altered precipitation amounts, but also increases the overall variability and hence probability for occurrence of extreme weather events (droughts, heatwaves and water logging). 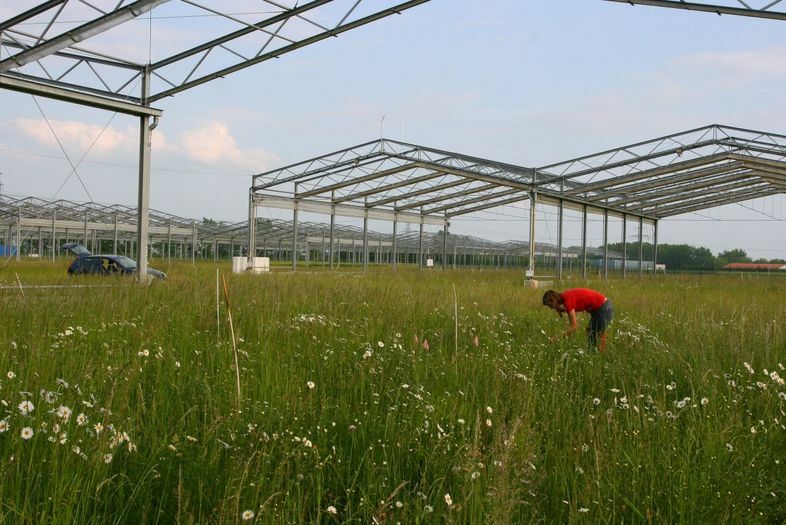 Surveys Our work group assesses climate change impacts at GCEF via plant functional traits, as these are known to be affected by environmental stress factors. In this regard, plant functional traits are not only response traits, but also effect traits, as some species’ trait syndromes will be advantageous under future climate conditions. The overall shift of traits within a community towards more stress-adapted syndromes could lead to major alterations in basic ecosystem services, such as fodder quantity and quality. Collaboration Our data sampling is linked to other surveys running at GCEF from several fields, e.g. 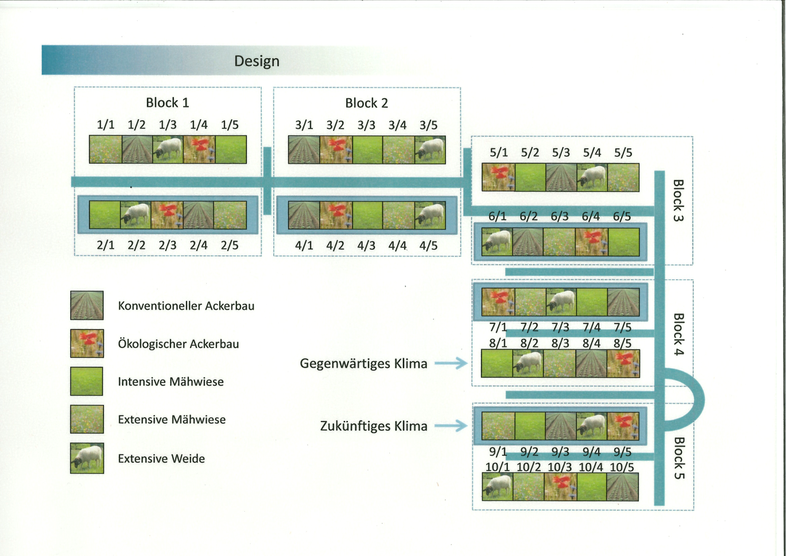 community ecology and genetics. Randomized split plot design at GCEF; 2 climate treatments ('Zukünftiges Klima' = future climate; 'Gegenwärtiges Klima' = control), 5 land use types, 5 replications; (Figure is property of Helmholtz-Centre for Environmental Resear, Leipzig, Germany). 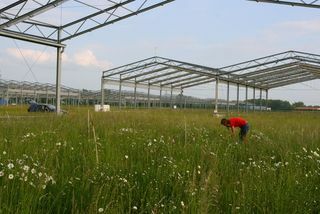 Extensive Meadow at GCEF; roof construction overhead.